GameSalad Publishing Binaries (RC & Current) — Welcome to the GameSalad forum! GameSalad is made of two parts. GameSalad Creator and the GameSalad Engine. When you "publish" your game, you're submitting it to GameSalad servers to turn into apps. Because the process lives on our servers, we can push updates to you without updating the GameSalad Creator Tool. If you publish with any 1.25.x version of GameSalad, you'll get the most current GameSalad engine. At times we'll have to do some "emergency" work that needs to be put in some users hands quickly. Sometime we just want to put something out for users to test and see if we missed something. These releases are called RC (Release Candidate) builds. RC builds haven't gone through our full battery of testing and are sometimes broken. But if you are daring (or desperate) and an RC build is available, you can try it out with the "Build RC" button in your publishing console. We'll be using this thread as sort of a "release notes" page for the RC versions of GamesSalad's Engine. Android: Support for Admob Banner / Interstitial / Video Rewards all at the same time. Ad mediation support via Admob for Chartboost only has been added. This is not our final ad mediation solution, but allows limited mediation on android between Admob and Chartboost for the short term. To enable Chartboost on Admob, you will need to configure mediation on your Admob console and check "Mediate Chartboost Ads" so that we can run some initialization code on the Chartboost libraries. iOS: Support for Admob Banner / Interstitial / Video Rewards. Updated Game Center code to use current APIs. New configuration fields have been added to publishing under the Admob service. To make life easier if you are just testing, the "Legacy AdMob Ad Unit" will be used on the current production build. If the new individual ad units are defined, they will be used. If not, then we will fall back to the legacy ad unit. If none are defined, then ads will not show. Admob App ID is a new field. Ads seem to work fine without it defined, but all example documentation has us setting the value, so I suggest you fill it in. Android: changed compile settings so sound now works again. iOS: Building with RC works now. Admob SDK updated to 7.33.1. Support for adjusting banner ads and loading wheel on the iPhone Xr (untested). Android: Fixed issue with log tag length that only affected the release build. Google Play Games Services updated to properly translate the % unlock value passed from the tool to incremental unlock defined for the achievement. Notifications now show when an achievement is unlocked. Some groundwork laid to allow for usage of all Admob ad types in the same app in a future release. Android: First pass at Google Play Games Services. Admob (and Google Play libraries associated with Admob and Games) and have not been fully tested. Android: Update Chartboost SDK to 7.3.0. Update OpenAL to 1.19.0. Removal of more GameCircle Code and Revmob. Target SDK is now 28. Android: Upgrade to OpenAL 1.17.x. Attempt to address the PARTIAL_WAKE_LOCK issue without crashing. iOS: Unchanged from 2018-06-16 release. May still have some problems. Built with updated NDK tools. Android: Fixes PARTIAL_WAKE_LOCK issue that causes the Google Play store to down-rank apps. Also cause apps to use more battery than intended even when backgrounded. iOS: Shifts loading wheel on iPhone X. Reports that the build does not work, we're looking into it. Android: Upgrade to SDK Target 26. Upgrade of Google / Android libraries to match Target 26. Update of Ad Networks to latest versions to support GDPR. privateDataConsentForAds attribute will now notify the engine when it changes, initiating an instant update to ad network settings. Doing things this way also prevents occasional crashes due to how we were polling the value. iOS: Upgrades of Ad Networks to support GDPR. privateDataConsentForAds attribute will now notify the engine when it changes, initiating an instant update to ad network settings. Doing things this way also prevents occasional crashes due to how we were polling the value. Are Chartboost reward ads working? I cannot get any ads to show, even in testing mode. The game attribute is definitely set to 1. We haven't made any changes and they were the last time we checked. I'm starting to think that Chartboost either has low fill rate or they are becoming stricter about not repeating ads and throttling users that are loading ads too often. One trick to try is to reset your phone's Advertiser ID, which should make you look like a new user to the ad networks. @adent42 Looks like they started filling eventually. @loganjan22 we're in hard push for some edu stuff this month. The idea is to get it ready by next week so we can get it all tested before the start of school in August. What I'm hoping is the stuff is bug free enough that during the end of next week I can sneak off and do some engine work. Hi @adent42 , thanks for everything you are doing! I read the whole thread but still have trouble understanding. In basic terms, as of today, what do I use to upload my android game? thank you. So for binaries it doesn't matter which version of GS you publish with. Any 1.25.x build with use the same 1.25 or 1.25.RC binaries. As for what to use. Hi @adent42 is there current version of gs viewer? i cant find the donwload anywhere. 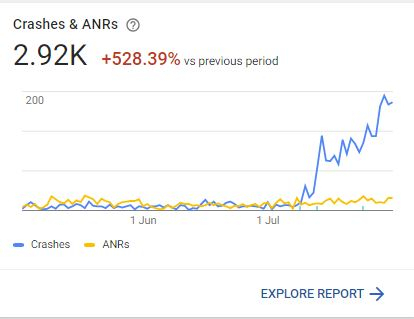 Since I updated my app on Google Play 29% of my users are experiencing crashes. Exactly the same app as before just re-published for GDPR compliance. @strag could you PM me a link to your final app? I assume it's something on our side, but since I haven't seen a lot of crashes, it's likely something to do with updated app wrapper + your app. The only crash I'm sure about is if you have AdMob on the screen at the same time as you call up Chartboost or another full screen ad network that uses HTML based ads. It doesn't happen all the time, but if there are two attempts at opening a web view than sometimes the app crashes. Otherwise, I'll need to investigate. Also, if you have any info on what devices crash, that will help. On another note, the team is trying to wrap up work for the beginning of the school year so it will take a bit longer to look into the issue. But, combined with another issue related specifically to Samsung S7 crashes, we try to make time to see what's up. I've sent a PM with crash reports. @adent42 Do you know that at least on s8, my game crashes when leaving the game with the back button? On s6 it doesnt crash but when I return to the game, all my sound effects are gone and muted. Music is still playing. Just tried this with my app and the same thing happens with the sound although it doesn't seem to crash. @strag did you try it on a s8? @Zwire the sound problem might be a side effect of us closing down the sound thread when we background (for the lock error that people were seeing). I did test with sound, but it looks like there are cases we missed. Can you PM me your game and I can take a look. @Zwire Yes I've tested on an S8. 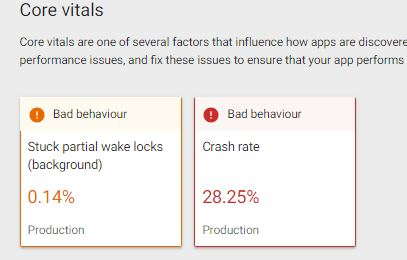 I personally am not seeing any crashes but my crash reports on Google Play have increased from about 0.1% to 28.25%! @strag are you using the RC? The RC should have stopped the bad behavior. @adent42 Yes it was built with RC. Just did another round of testing and I'm actually getting lots of crashing. As @Zwire said before, exiting the app with the back button and then opening the app again seems to cause issues. Sometimes the music plays but all sound effects are gone. Sometimes I get a coloured bar top and bottom on the first menu screen. And sometimes it just crashes on startup. Something else I noticed. On the first screen there is a brief flicker where I can just read some text in a band at the bottom of the screen which says 'tap here to fill entire screen'. Does this help/make any sense? My builds using the latest RC button were okay. No big issues thus far. Still, of course we are still doing internal builds. So anything we notice we will post and share here. Just curious...are your apps on Android? If so have you tried exiting using the back button and then going back into your app a few times? This is what seems to be causing 3 of my apps to be unstable. Yes we are developing on Android. And yes exiting is an issue, I found that GS does stay with the instance if you choose to just leave the app and say go to other apps (like when you go chat and do other things). And when you get back, sometimes it will be back to where you were, and sometimes it unloaded from memory causing you to lose all of what you did in that game instance.. I have yet to get to that part.. But for your question of using back button to exit, you can actually choose to not "exit application" from back button. That can be done under your web interface of your app, Android settings -> Hardware -> "App quits on controller back button.". I think that is one thing we should all do to avoid the app from acting from unwanted behaviours. Then you may on GameSalad, intentionally set the input "Esc" key as an input and exit the app with a Yes/No menu, and if Yes, unload everything and reset all the temporary parameters properly, thus sorting the issue for the user in my opinion. 2. When I temporary exit (say using a chat app, phone call etc) and back to my game, what happens? And how should I control it? Hey thanks for the suggestion...great call! I had no idea that the esc keyboard command was mapped to the back button on Android...doh! I did exactly as you said, disabled "App quits on controller back button" from web app settings and added 'when key esc is pressed quit game' to the app. From initial testing it seems stable when generating app with legacy 'generate apk' button but not with RC build. Still crashes on startup. Yes, those are better practices from my experiences. I think in that case, it is likely due to some internal logic your app has, I would suggest you look at how to recreate that error, what errors are also happening at the same time. Then see what issues may have caused that problem and go from there. @Twayne2 it's on the publishing console. The reason it only affects android is that it's the only place where it's allowed / makes sense. At least at the time we made it, iOS doesn't allow an app to "quit", just background through the home button. Android consoles (FireTV), did need quit functionality available, so we added it there. As an FYI to all, engine / tool work will be delayed another week because we're still ironing out some kinks in education. The good news for all is that one of the things I need to iron out is performance of our authentication servers to prepare for an influx of students. This give everyone benefits as it improves site reliability for all. If I get done early or take breaks I might be reaching out to people to get a refresher on issues people have been having with the engines. Thanks for your patiences everyone! I've tried a couple of apps but I don't see a crash yet. I'm not running on a Samsung S8, so if that's the requirement for the crash, it may be a while before we can figure it all out. Based on info @strag has sent, it's not limited to Samsung S8s though, so hopefully we can get a repo case and kill this bug. Once I get a few responses, I'll make a new post/thread for this issue and post a link here. Hopefully we can get to the bottom of this. In the mean time, we're gonna start making some RC updates soon with other fixes features (as we figure out what we want to look at). RC update at the top of the thread. We still can't repo the crash on the devices we have, but we did some sensible things like getting a much newer version of OpenAL and changing how we trigger the suspend/resume of OpenAL. The new version of OpenAL also uses Android's OpenSL which is their preferred sound system. These things combined will hopefully fix the crash issues, so give them a try! (We'll continue testing here as well).